Years before the personal weather station became a household gadget; it was Davis Weather Instruments that put accurate, near pro-grade weather stations in the hands of consumers. Things have changed though, and Davis is no longer the only worthy option for weather watchers. I have owned two Davis stations over the years myself and paid quite a bit for them. In the late 1990s and 2000s. The price hasn’t changed much, but you’re paying for quality. To be clear, our preference even with the higher price is still the Davis Vantage Pro2. But if you cannot afford the Vantage Pro2, then the Vantage Vue is the next best thing. It measures all the standard weather variables including inside and outside temperature and humidity, barometric pressure, rainfall, wind speed and direction. The Vantage Vue also comes with a desktop console which is a nice alternative to an app or web-based connection to check weather conditions quickly. Davis does unfortunately disappoint us with its extremely dated connectivity options. Adding Internet connectivity costs you extra, and is something other stations include at no cost. Is it worth it? The answer depends on what's most important to you, and what you need a weather station for. The Davis 6250 Vantage Vue is the best alternative to the Vantage Pro2. However, if accuracy is critical—we recommend the latter if you can afford it. The Vantage Vue’s accuracy is nearly on par with the Pro2 but does lag in some areas. Like the Pro2 the Vantage Vue also has no internet connectivity out of the box, so you’ll need to purchase additional proprietary hardware for that. Setting up the Vantage Vue is not plug and play, so set aside a half hour to get things up and running. You'll have to do some minor assembly—attaching this, screwing in that—but don't panic, Davis' instructions are clear and easy to follow. If you bought Weath﻿﻿erLinkI﻿﻿P to connect to the internet, there are a few more steps that you'll need to complete depending on which one you've bought. We'll cover that later. We'll remind you of our sensor placement suggestions which can be found in our buyer's guide, but keep in mind the sensors are an all-in-one package, so you won’t be able to place the anemometer at the recommended 33 feet and at the same time have the temperature sensor at 5-6 feet. You’ll have to make a compromise on the height of your installation depending on the readings that are most important to you. We expected top tier performance from the Vantage Vue, and that's what we got. All sensors performed during the test without issue and were some of the most accurate we've seen. For example, the outdoor temperature/humidity sensor was more often than not extremely close to our "control" NWS station about five miles away, and more accurate than just about any station we’ve tested. The station also reports conditions in as little as 2.5-second intervals depending on what's being measured, which is best in class among the stations we've looked at so far, and matching the Vantage Pro2. Davis' sensor shielding is what makes the difference. The temperature/humidity sensor is enclosed in louvered radiation shielding, which is recommended to ensure accurate readings. This keeps direct sunlight from causing temperature readings from reading too high—something other stations struggle with. At times though, we did notice some issues with humidity readings, but not dramatic problems. 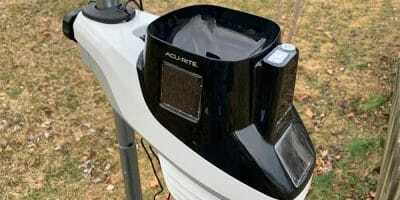 The rain gauge also performed well, which like most personal weather stations works through a tipping mechanism that attempts to measure rain by the tips of a small cup inside the gauge. The measured rainfall was generally quite accurate, and closely matched traditional rain gauge measurements. The anemometer uses the standard cup and vane, the preferred method among the pros. However, with the Vantage Vue's 5-in-1 sensor package, you can’t get the anemometer separated from the other sensors so you won't be able to mount each sensor at the recommended height for the best accuracy. 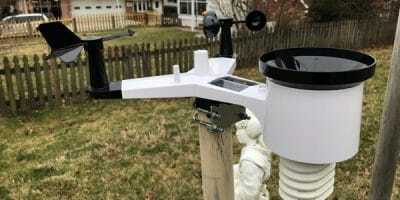 The temperature and humidity sensors along with the rain gauge should be placed at “eye level (5-6 feet), while the anemometer should be at the height of 33 feet! This is not an issue with the Pro2, as the anemometer is separate from the other sensors. For those who require more precise siting, the Davis Vantage Pro2 will be a better option. This is going to be an awfully short portion of the review for one big reason: there is none. None of Davis’ optional sensors can be added to a Vantage Vue station—you’ll need to purchase a Vantage Pro2 for that. One area where we are very disappointed in—really the only area when it comes to either Davis station—is internet connectivity. The optional WeatherLinkIP addon allows you to import data to your computer, and then to services like Weather Underground, and through apps available for both iOS and Android. You're essentially paying for the dongle (which attaches to the back of the console), and licensing of the software. Windows and OS X versions are available, but for an additional fee, you can get a version that connects directly to your router called WeatherLinkIP. This module will post your weather data directly to the internet without the use of a PC. That's the version we were sent for testing. Regardless, it’s super simple to get your data online with WeatherLinkIP. Take a note of the device ID and key on the dongle, then remove all power to the console. Plug in the dongle, connect it via Ethernet cable to the router, and power back on the console and wait for the confirmation beeps. Head on over to WeatherLink.com, register for an account, and you should see all your data online. As soon as you're in, you're going to want to click on "My Account," and make sure that all the information is filled in and correct. If you're looking to upload data to a service like Weather Underground, head to the "Uploads" tab. Other than that, the "My Weather" tab shows a nice graphical representation of your data: think what the weatherman stands in front of during a weather report. The "Summary" tab will provide some greater detail. However, if you're looking for graphs or more detailed historical data, you're going to need to install the software. WeatherLink is also available as a mobile app for both iOS and Android, giving a basic overview of current conditions, as well as daily, monthly, and yearly extremes. Give Davis a little bit of time for your station to show up here though in searches. It took us about an hour or two before we found it in the search function of the app. A word on the PC or Mac desktop apps for WeatherLink: be prepared for a dated interface. The no-frills UI is the same one used for close to two decades—I seem to remember an MS-DOS-based version that even had this UI! You could spring for a more user-friendly third-party software option if this bothers you, but you still need that dongle. There's no way around it, we've checked. What we really like most about the Vantage Vue is how close it is to the Vantage Pro2 in terms of accuracy. This is what has kept Davis at the top, and even in trying to produce a station that more consumers can afford, that key feature hasn’t been lost. The sensors themselves are reliable, and owners report years of trouble free use in most cases. Davis needs to get itself in gear and provide built-in internet connectivity. Spending an extra hundred or two just to do what other stations do out of the box is painful. For people where price is the deciding factor, it’s tough to justify that additional cost, even though it is truly better. 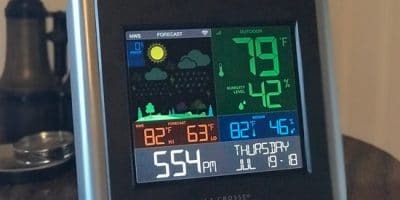 If you’re looking for a top home weather station other than the Vantage Vue, and have additional money to spend, we recommend the Davis Vantage Pro2. You can place all the sensors in spots that will provide the most accurate readings, and the Vantage Pro2 is built even sturdier than the already impressive Vantage Vue. If you're unable to spend any extra money, then take a look at the AcuRite Atla﻿﻿s. It features a modern HD console and the ability to separate and extend the anemometer for accurate wind readings. Deciding whether a Vantage Vue is right for you comes down to one thing, and that is the price. Very little about the station has changed over the years, and even the console looks and feels a bit dated. But the accuracy you get out of a Davis station is unparalleled. With this said, we feel the lack of internet connectivity—and the cost to add it—stings. It’s the only area that Davis needs to work on though, and if you have the cash, you’d be foolish not to put either the Vantage Pro2 or the Vantage Vue at the top of your list. They’re just that good. The Davis Vantage Vue is still one of the best, but the Cadillac of home weather stations is showing its age. The additional expense to have internet connectivity through an outdated application is frustrating but the performance and reliability the Vantage Vue provides offsets these issues.